Coinbase users can now purchase e-gift cards through Coinbase. Is this just another Coinbase service or part of a larger strategy to replace fiat money and payment processors like Mastercard? 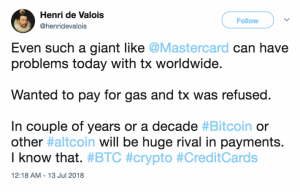 And why cryptocurrencies will never replace Mastercard. Last Wednesday, Coinbase announced on their blog, that through a partnership with WeGift, customers can now use their Coinbase wallet to purchase gift cards. Customers pay zero withdraw fees and get a bonus on selected e-gifts. Currently, the service is available in the UK, Spain, France, Italy, Netherlands, and Australia. Crypto proponents have always wanted to replace traditional FMI (Financial Market Infrastructure) with cryptocurrencies. This has again become very apparent when Mastercard had an outage two weeks ago. Following a payment outage at Visa, around 5m Mastercard debit and credit card payments failed to process. Mastercard did not mention the cause of the outage (see the Financial Times’ archived report). 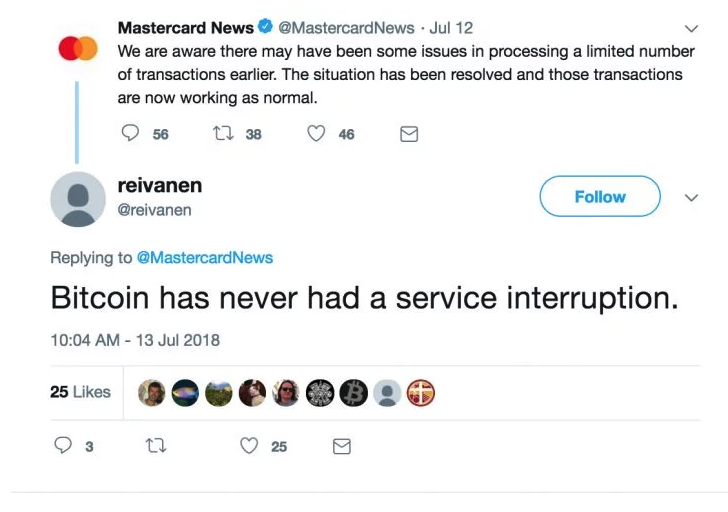 Based on this outage, crypto proponents started preaching crypto’s superiority to Mastercard and saw Bitcoin as a replacement for it. Regarding the Payment Area, Mastercard covers Consumers, Merchants, Governments & Public Sector, Businesses, and Issuers (& Other). And within these sectors, they have different solutions. The ID Theft Alerts scrapes the Internet for identity theft, with their National ID, they are collaborating with governments on ID systems, and they have an Emergency Wallet Replacement program in place, to name a few (see Mastercard’s corporate website for more). In regards to these multiple offerings, there are two types of crypto startups; “unbundling startups” and “full-stack startups”. Unbundling startups select certain solutions (Payment Areas or Auxiliary Services) and spin them out into stand-alone products. Full-stack startups try to cover as many solutions (Payment Areas or Auxiliary Services) as possible. In the best scenario, full-stack startups start incrementally with a limited scope (e.g. selected Payment Areas in selected countries). Coinbase would best be classified as an “incrementally growing full-stack startups” (what a name). With Coinbase.com they target average investors who want to invest in established cryptos (established in terms of age and market cap). With gdax they target more experienced traders, again for established cryptos. Blockr.io, the blockchain explorer, is integrated into those services as a feature to help users track their transactions. Finally, Earn.com and Cipher Browser are positioned at the beginning and end of a user’s crypto lifecycle. With Earn.com users are on-boarded and hooked into the crypto world through small steps, without risk and most importantly for free. While completing tasks on Earn.com people might learn a thing or two about crypto projects and simultaneously receive money that they can use to invest further; firstly via Coinbase and later on gdax. Moreover, they can buy additional cryptos through Coinbase.com or gdax. Finally, after purchasing cryptos people browse dapps with the Cipher Browser and find applications where they can spend their cryptos. With their foray into donations and gift cards, I am inclined to rephrase “crypto lifecycle” to “payment lifecycle”, seeing Coinbase more and more resemble a full-stack “Mastercard replacement”. The impact of crypto donations is threefold. Besides the obvious financial support, I believe it is important to highlight their impact on the overall crypto and financial industry. In regards to the financial industry, they are a way to bank unbanked people. To receive donations, recipients only need a smartphone with internet access. Given the high availability of phones (especially when compared to access to bank accounts) and openness of blockchains, donations provide an easy way to distribute bank accounts and money to the unbanked population. However, what remains is the fact that previously unbanked people won’t be able to convert crypto to fiat. This will either lead to the emergence of local exchanges that trade crypto for cash or the absence of these exchanges will force the presence of crypto, i.e. people will start transacting exclusively with crypto. In the long-run, the emergence of such a crypto-to-crypto economy shows how crypto donations could support the diffusion of cryptocurrencies. From the “Mastercard replacement view”, donations are yet another Payment Area. As such, it should not come as a surprise that Mastercard is active in related fields. For example, the Mastercard Aid Network is a payment system where prepaid cards are pre-loaded with a parcel of physical goods – sort of digital food stamps – to be redeemed at selected merchants. Similarly, buying gift cards is another Payment Area Coinbase is occupying. And as is possibly widely known, Mastercard offers Gift Cards as well. Admittedly, for all their payment activities Coinbase still depends on payment processors like Mastercard as their fiat on-ramp. However, as Mastercard’s Aid Network shows, one does not need money to purchase goods. In fact, Coinbase owns a vaguely similar non-fiat on-ramp, namely Earn.com. Earn.com is a task platform, dominantly for crypto-related tasks such as joining a Telegram group, and was acquired by Coinbase. Besides that, there many other crypto on-ramps such as Airdrops or “bounty hunting”. Keeping up with this strategy, Coinbase might replace Mastercard before any other cryptocurrency.